The SOLIDWORKS Motion Manager consolidates Dynamic Assembly Motion, Physical Simulation, Animation, and SOLIDWORKS Motion (included with SOLIDWORKS Premium or purchased as an add-in) into a single, easy-to-use interface. The Motion Manager has a key frame-based timeline and controls motors, gravity, and springs based on time. With a single setup, you can see how an assembly moves and how components interact, create presentations, and obtain component velocities and accelerations for validation purposes. SOLIDWORKS Motion Manager enables you to create compelling AVI files from SOLIDWORKS parts and assemblies, allowing you to communicate design concepts and collaborate more effectively. No special expertise is required to use SOLIDWORKS Motion Manager, and it’s affordable enough for every designer and engineer. Point-and-click Animation Wizard makes animation effortless. Capture assembly motion instantly to reveal how moving parts will interact. Explode or collapse an assembly to demonstrate how components will fit together. Fly around a model or revolve it 360 degrees on a turntable to show every angle. Simplify creation of sophisticated animations with enhanced controls for explode, collapse, and pacing functions. Make product design changes fast and shorten development cycles by circulating design AVIs for review via email. Produce design AVIs for computer-based technical support documentation and training materials. Full integration with PhotoView 360 rendering software to create photo-realistic images in the animation, such as, special surface texture, lighting, or background. 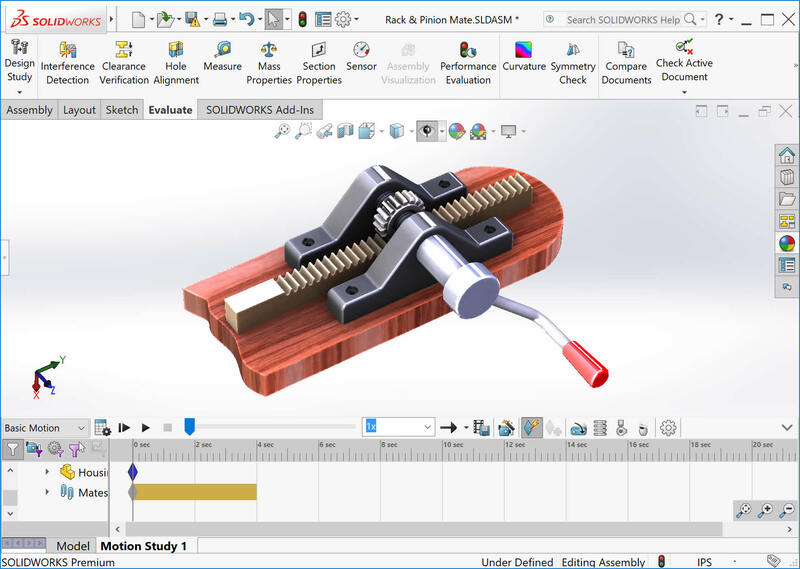 Capture and share SOLIDWORKS Simulation® and SOLIDWORKS Motion™ results with animations that allow you to rotate, explode, collapse, and present different camera views of your analyses. SOLIDWORKS Motion Manager is seamlessly integrated with SOLIDWORKS and PhotoView 360, allowing you to easily take advantage of the unmatched solid modeling capabilities and photo-realistic rendering features. Ensure accuracy through fully associative design – mating constraints are preserved and the relationships between parts, assemblies, and drawings update automatically. Prevent errors and optimize designs by using Collision Detection to observe in real time how moving parts interact as true solids. Improve visualization with enhanced graphical control of lights. Create photo-realistic effects by means of sophisticated ray-traced lighting effects and the ability to define material properties and apply materials to parts and features. Increase the impact of presentations with an extensive library of materials and textures and background scenery. Save time with easy access to built-in online help and support. Demonstrate the results of any add-on applications that provide single-window integration with SOLIDWORKS, including Certified Gold software solutions from SOLIDWORKS Partner Products. Analyze and improve design processes by rolling back and replaying the complete history of a design project. Capture the result of any VBA (Visual Basic® for Applications) macro to document an automated design process. The SOLIDWORKS Motion Manager Add-in is part of the SOLIDWORKS Premium software bundle from Javelin. Interested in the SOLIDWORKS Motion Manager Add-in?